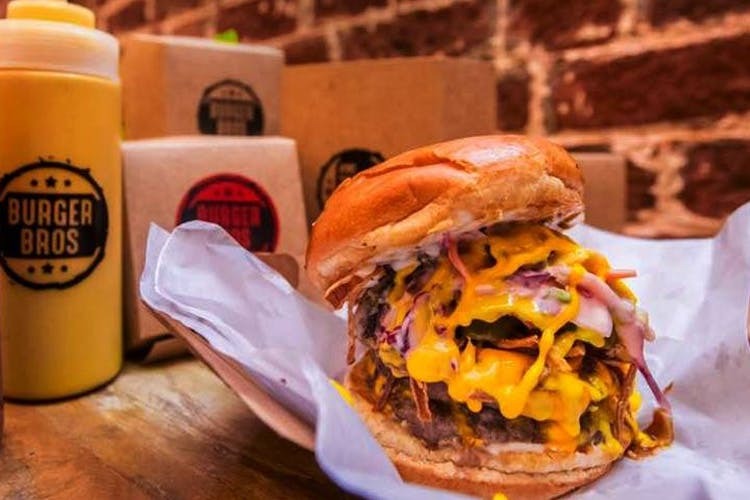 Love burgers and are on a mission to try the yummiest burgers around? This new Carter Road eatery is all about burgers and here’s why you should go check it out. We only recently stumbled upon Burger Bros at Carter Road, the newest eatery to open its doors in this already food-flooded territory. This yet new burger joint has replaced what formerly was Loco Chino, and we’re not disappointed with all that’s on offer. Delectable, juicy and meaty burgers leave you with very little room for complaints. When there, dig into their double cheese burger which hits the spot right. Priced at INR 265, it has a double tenderloin patty which make you wanna come back for more. Also have their super yummy lamb kebab bro which is priced at INR 225 and is the perfect choice for all those who’d like to give tenderloin a skip. Needless to say, mutton lovers will enjoy every bite of it. And while you’re busy eating the burgers, don’t forget the cheesy homemade, hand-cut fries for INR 95- you deserve them/. The place can accommodate 8-10 people and is ideal for home-delivery and takeaways. We’re thinking this might be the perfect place for when you’re super hungry and craving hot, patty-stuffed buns. A lazy Sunday lunch, maybe? We suggest you go grab a beer after.